The Berlage Institute will cease to exist on 1 August 2012. At precisely the same moment a new institute, called The Berlage Center for Advanced Studies in Architecture and Urban Design (The Berlage in short) will open its doors within the faculty of architecture at Delft University of Technology. Current first-year participants at the Berlage will be able to complete the final year of their course at the new institute, while those who have applied for the next academic year can start their studies here. An interview with Rob Docter, general director of the Berlage Institute, about the old and the new Berlage, and about how times change. A year ago, in April 2011, the Council for Culture recommended rigorous cutbacks to Halbe Zijlstra, State Secretary for Education, Culture and Science. Among the recommendations was that, as of 1 January 2012, the Berlage Institute would cease to be part of the basic infrastructure of cultural institutes funded by the state for a four-year period). Zijlstra embraced this advice without reserve. As stated in its 2011 Board Report, the Berlage Institute felt it had been dumped unceremoniously on the rubbish heap. It seemed that the fate of the post-academic institute was sealed. How would you characterise the current Berlage Institute? The Berlage Institute was founded in 1990 at the instigation of Hedy dAncona, Minister of Welfare, Health and Culture at the time, with an explicit cultural objective: to be a place of work for architects who wanted to deepen their artistic skills after completing their studies. That cultural dimension was important for the positioning of the Berlage Institute in the Netherlands and in the world. Over the years the institute shifted from an individual workshop model towards group work in a studio model. People now come here to gain proficiency in a number of skills, such as collaborating within multidisciplinary teams, working in an international environment, and undertaking design research into practice-related issues within a studio environment. How does the Berlage Institute compare with post-academic design institutes in other countries? We are by far the smallest, but in terms of standard of output and quality we can hold our own with the best. This is largely because of the fact that we are a cultural institute, not an educational institute. That enables us to respond rapidly to unfolding events with specifically tailored projects, in contrast to institutes that are tied to a fixed program or curriculum. Answering a current design or research question was typical of the Berlage. Case in point: Yushi Uehara gave a master class about the reconstruction problems in Sendai in Japan two months after the region was hit by the tsunami and the disaster at the nuclear plant. We did, however, always implement the workshop model, and later the studio model, in an educational manner. In that sense, the institute is hybrid in character. At the same time, we have always resisted a transition into education, a move that was often encouraged within government circles. Now it is unavoidable, and perhaps no longer so odd. Over the years the function of the Berlage has changed, the reasoning for its functioning has changed, and the wishes of the participants have changed too. Could you mention a number of changes? Over the past twenty years the Berlage has become more international. Our target group has shifted significantly: from the Netherlands and Europe to the rest of the world, with a strong emphasis on Asia. Moreover, the previous training enjoyed by our new participants has changed. Although we offer a post-academic program, over half of our participants possess a Master degree, and the others have completed a heavy five-year Bachelor course. In addition, in recent years we have seen an intake of people with a number of years of professional experience. Chinese participants in particular have experience in realising an awful lot of m3. They come here to learn about those aspects of the profession that are important for quality. In what way does the new institute at the University of Technology differ from the current Berlage Institute? Even within the new constellation it will remain a post-academic course. The program is more or less comparable with the current Berlage program, so that the first-year participants who started in September 2011 have the chance to complete the course at the new institute. The studio program, in which internationally acclaimed architects supervise participants intensively in a workshop environment, a place where new and interesting developments in the profession are discovered and tested, will also continue. Our extensive and broad-ranging international network is one of the main reasons why the university in Delft was interested in the Berlage Institute. Even though  or precisely because  we are a small organisation, we seem to succeed in securing the involvement of interesting people. These are the similarities. The big difference is the change from cultural institute to educational institute. 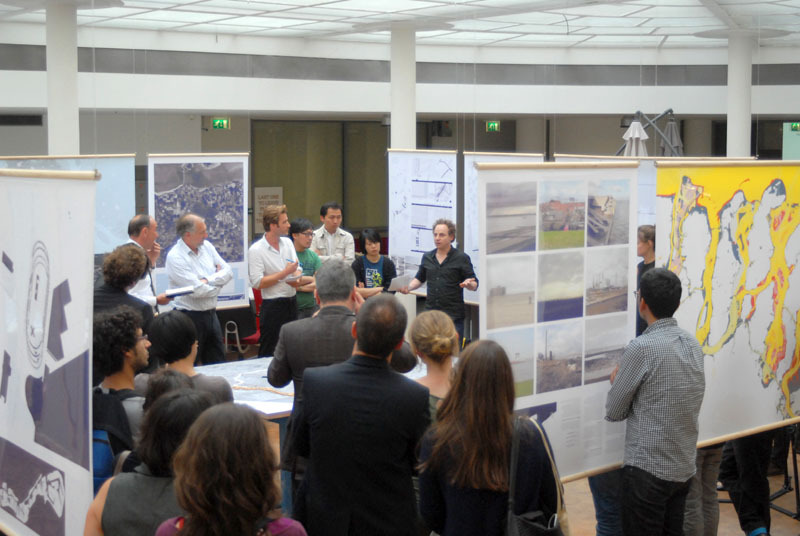 Up to now, the people who completed the course at the Berlage received a certificate of participation. In recent years our group of Asian participants has grown enormously, and so too has the demand for a recognised qualification. As a cultural institute, we were unable to provide that, but the new institute can. The course will be recognised and participants receive a diploma. Whats more, the duration of the course will change. The current two-year program will be replaced by a course made up of four semesters (1 year and 3 months), with three studios per semester. About 36 participants are expected to enrol for each course period. Couldnt the Berlage Institute itself have transformed from a cultural institute into an educational institute? No, that was not an option. First, because of the time needed to complete such a transformation. We were not granted that time; a year and a half would not have been long enough to complete it. Besides, ours is a two-year program. Second, it is highly unlikely that the Education section within the Ministry of Education, Culture and Science would invest funds if the Culture section within the very same ministry had decided to discontinue funding. We did of course examine whether the Berlage Institute could remain in existence in some form or another. Countless letters were written to Dutch parliamentarians and the government, we received declarations of support from respected names in the profession, we lobbied with other post-academic institutes, the opposition in parliament did everything it could to reverse the decision  but it was all to no avail. The state secretary was unapproachable, and it was clear in advance that the coalition government headed by Prime Minister Rutte wasnt going to collapse on account of its culture policy. Its a pity it all happened this way. It is deeply regrettable that we were granted so little time to prepare a Plan B. Last year we celebrated our twentieth anniversary. As part of that, we engaged in some self-reflection: imagine that we had to reinvent the Berlage, what would it be like? Political reality has overtaken us now. But I am very happy with the enthusiasm and hospitality we met in Delft. The Berlage will get a new chance and opportunity to fulfill its promise thanks to the architecture faculty. Knowing that the faculty of architecture at TU Delft is making substantial cutbacks, why has the university chosen to incorporate the Berlage Institute? On account of our name and reputation. To make use of existing expertise and experience, it is expected that five of the institutes current ten employees will be offered positions at the new institute. An academic director, who has yet to be appointed, will head the Berlage. This position was previously held by the Dean of the Berlage. One of our current employees will probably take over the day-to-day running of the institute. The new institute will operate as an autonomous foundation, financially independent of the university. It will simply pay rent. The new institute will be financed by the fees of participants and contributions from third parties, but not from the primary funding for education. Apart from that, however, the institute falls under the administrative responsibility of the TU Delft. Will the new Berlage maintain the strong identity of the current Berlage Institute? Retaining a distinct identity is difficult when you are housed within another faculty, even if the Berlage will have a recognisable space of its own. The new institute will therefore have to conduct an active publicity program and exploit every opportunity to carve out a distinct profile for itself. Winy Maas has demonstrated that it is possible. His Why Factory is seen as a separate department. What will disappear with the arrival of the new institute? What will disappear is the freedom, the way in which we could do want we wanted without any restrictions, chart our own course just as we wished. Even though the new program will be decided each year and guest tutors from all over the world will be flown in, thus guaranteeing quality, the new institute will be slightly less versatile, less able to respond to events as they unfold. The reality is that an accredited educational environment dictates certain conditions. But the greatest loss I think will be the role of the Berlage Institute as a breeding ground. People like Bas Princen and Daan Roosgaarde, both of whom could develop the spatial and conceptual dimensions of their artistic discipline even though they had no previous training in architecture, would not be admitted to the new course on account of the entrance requirements concerning previous education. Further, the cultural role of the Berlage as a platform will be scaled down. For example, the periodical Hunch will probably disappear. You cannot speak in terms of gain. It is difficult to understand why something that was established and flourished at the instigation of the government is now being destroyed in such a seemingly thoughtless manner by the same government. All the more I appreciate the willingness of Delft University to take responsibility for saving the postdoctoral function. The Berlage Institute  as one of the elements in a much broader infrastructure  was set up to effect a change in mentality. Architecture had to become a cultural act. And that has happened. In the Netherlands, architecture as a cultural discipline has reached maturity now. Time now for the next phase. The Berlage Institute will bid farewell to Rotterdam with a final exhibition at the Schieblock building. The exhibition opens in June.